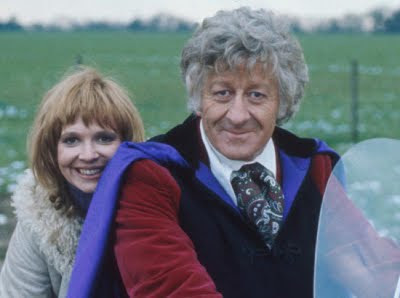 Trine-E and Zu-Zana are back to take us through Jon Pertwee’s second year as The Doctor. Let’s see if he’s taken the advise to bring some more colour into his wardrobe, or has he just slipped back into those same old familiar black rags . . . 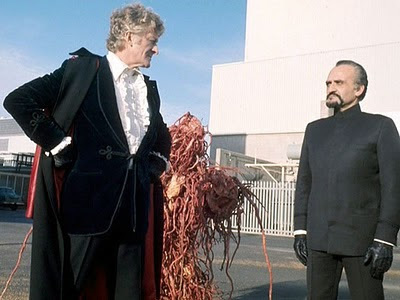 The Doctor opens the story wearing black trousers; a maroon velvet smoking jacket with a rolled collar, black cord piping and double frog-fastening; and an unusual zip-fronted white frilly shirt with no cravat. (see right, and below bottom left). For early exterior scenes he wear a new black Inverness Cape, this time lined in purple silk, with frog-fastening. 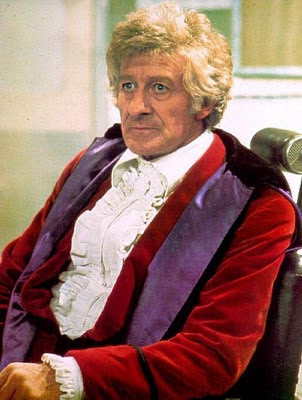 This new costume is short-lived, however, as halfway through episode one he reverts to the same velvet smoking jacket and Inverness Cape from his first season, though retaining the new zip-fronted shirt, with no cravat. Some minor work had been done on the Inverness Cape, adding four frog-fastenings down the front. The latest DVD release has a new restored image, and it is possible to see that the fabric of his shirt has a satin self-strip (see right). This shows there was more than one of the new design shirt used. 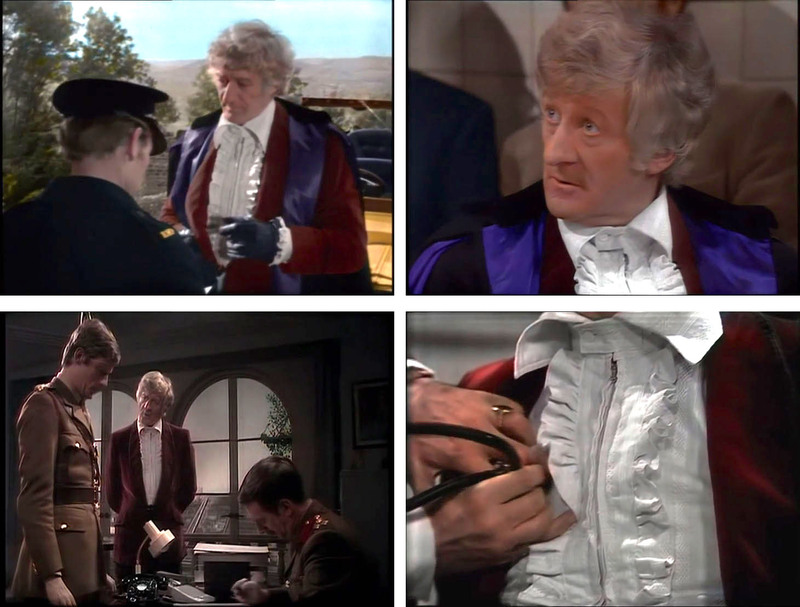 The Doctor returns to wearing black trousers; the maroon velvet smoking jacket with a rolled collar, black cord piping and double frog-fastening; the new black Inverness Cape, with purple silk lining and frog-fastening; the zip-fronted white frilly shirt with smaller collar (see below bottom right); and no cravat. 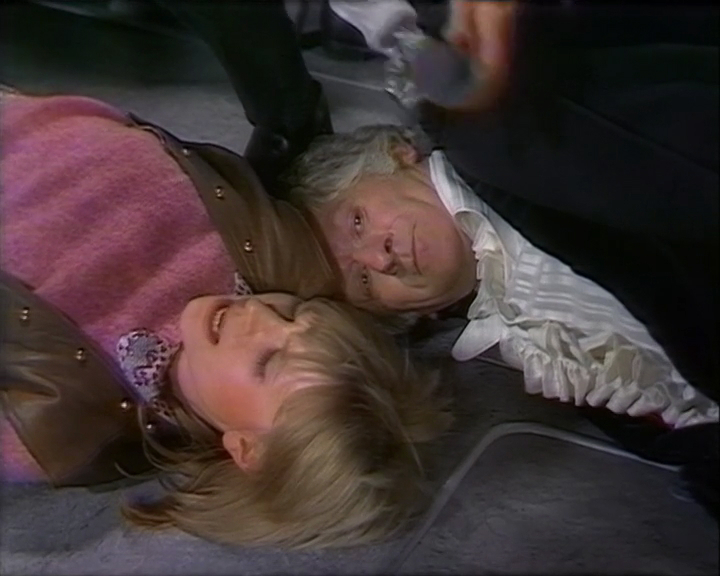 The Doctor again does his amazing quick-change act in episode one. He opens wearing black trousers; the maroon velvet smoking jacket with a rolled collar, black cord piping and double frog-fastening; the new purple-lined double frog-fastened Inverness Cape; the zip-fronted white frilly shirt with smaller collar and no cravat. (see below, top row). 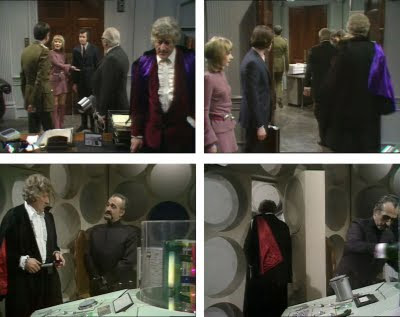 But halfway through episode one he reverts to the red silk lined Inverness Cape; with a midnight blue velvet smoking jacket; but again retains the zip-fronted white frilly shirt with no cravat (see above, bottom row). 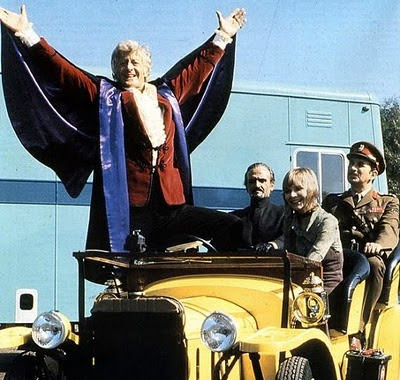 No explanation is given for this change, or the one in Terror Of The Autons. Throughout the story The Doctor wears the midnight blue velvet smoking jacket; the zip-fronted white frilly shirt with smaller collar; no cravat. He adds the previous season’s red silk lined Inverness Cape for some scenes. 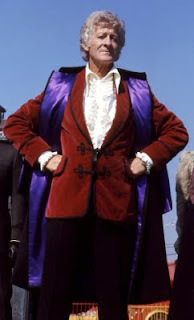 This time The Doctor brings out his maroon velvet smoking jacket with a rolled collar, black cord piping and double frog-fastening (see below left); the new purple-lined double frog-fastened Inverness Cape; the zip-fronted white frilly shirt with enormous collar and an one-off paisley cravat. (see below right). Well, better than last year, with that maroon smoking jacket and paisley cravat a welcome splash of colour and pattern (see above). But those black capes and smoking jackets keep coming back (see below). Just changing the lining colour doesn’t stop black being – well, BLACK! Looks like we’re gonna have to come round and tear them up . 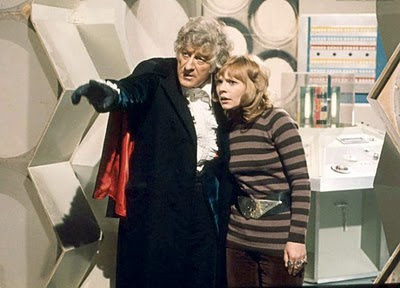 . . if we could find his TARDIS!